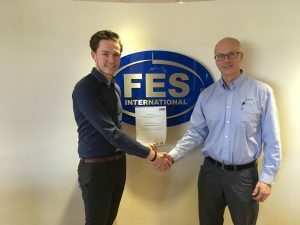 A young apprentice from Blyth has been appointed as a full-time Junior Project Engineer with Ashington based engineering firm FES International, having successfully completed a four-year apprenticeship with the company. Cameron Ferguson, 20, graduated from the scheme with a BTEC Higher National Certificate in Mechanical Engineering from Tyne Metropolitan College and a Level 3 Advanced Diploma Apprenticeship in Engineering Technical Support from Tyne North Training. After an initial six months at College, Cameron followed a day release programme to focus on practical achievements through completing several assignments with FES. He spent over three and a half years with FES within the projects department learning how to carry out the duties required to provide a range of products to meet FES client requirements. Managing Director of FES International said, “Our apprenticeship scheme exists to nurture and develop talent and encourage more young people into a career within engineering. Cameron has worked very hard over the past four years and has impressed us with his attitude and his ability to learn quickly. “In the North East we have an established supply chain serving the global oil and gas industry but it is rapidly ageing along with the population. It is critical that we are developing home grown talent for the future of the industry in the UK and budding young engineers that wish to stay in the North East. Cameron Ferguson said, “I have always showed an interest and studied different forms of engineering throughout high school. Although I wanted to leave school and move onto further education, I didn’t like the idea of studying full time at college or university. An apprenticeship seemed the perfect option for me. “I am thoroughly enjoying being part of the team at FES. I have been involved in a huge variety of projects where I am involved in making, testing and delivering a vast range of products to customers all over the world. “Buts it’s not just the technical aspects of the job I have enjoyed. By speaking to international clients daily, I have benefited from learning essential people skills too which have helped me to establish a greater understanding of the ways and means of speaking to others in business.